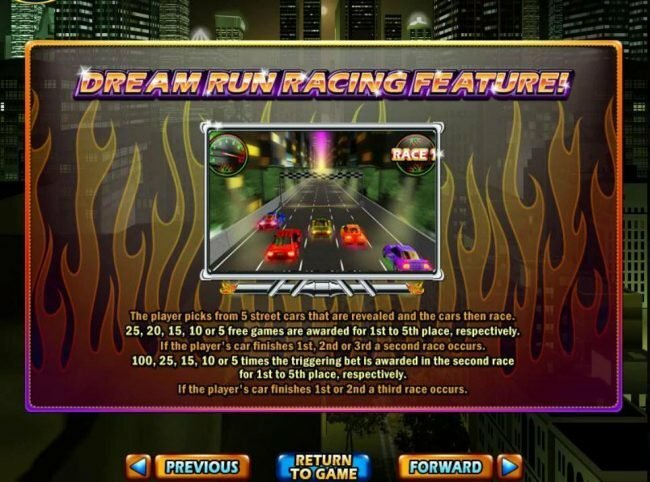 Dream Run is a 5 game reel online slot with a top payout of $50,000 using the street car racing theme. 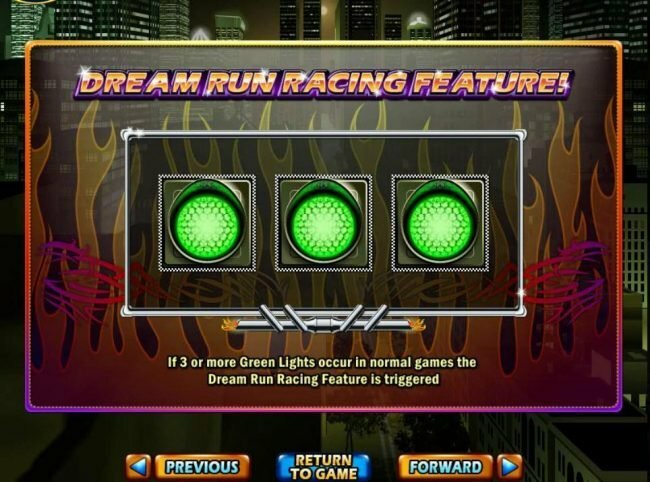 Dream Run Slots 5 out of 5 based on 2 ratings. 2 user reviews. 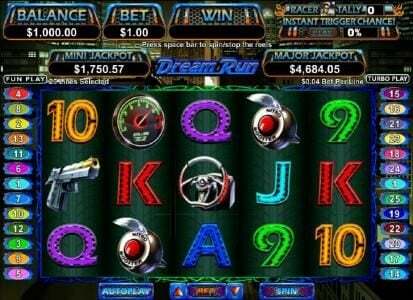 Dream Run is a 5 reel, 25 payline video Slot game created by software developers Real Time Gaming. 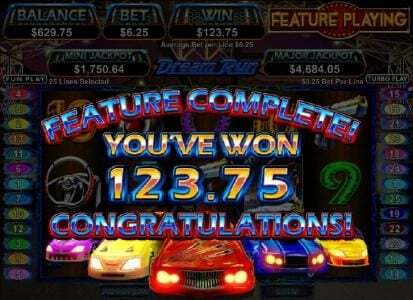 This game has a wild symbol, Free Spins bonus, scatter symbol, multiplier and a jackpot worth up to $7,500. 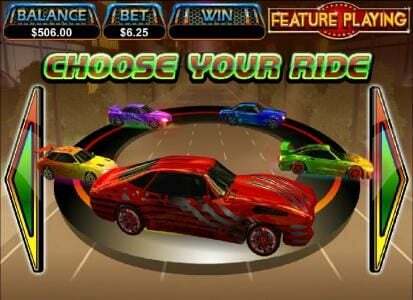 This slot game is based all around street racing and the adventure behind it. 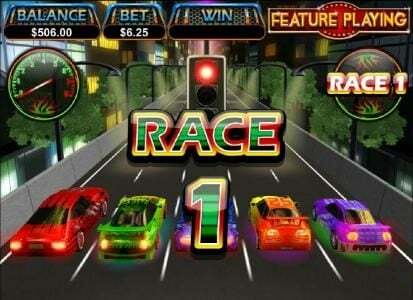 You will see a race on the reels, some traffic lights, a steering wheel, guns, speedometers, regular symbols like A, Q, K, J, 9, 10, wheels, grid girls and nitrous buttons. This is what makes the game come off as so realistic. Players will have the ability to either wager anywhere from $0.01 to as much as $1 per payline. You can wager on all of the 25 paylines which means the maximum wager for this game is $25 per spin. There are two wild symbols in this game. 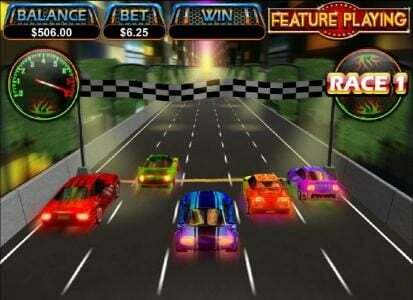 You will see the racer who appears on the first reels and the opponent who will be on all the other reels in the game. Both of these wilds will replace all the other symbols in the game with the expectation of the traffic lights symbol. 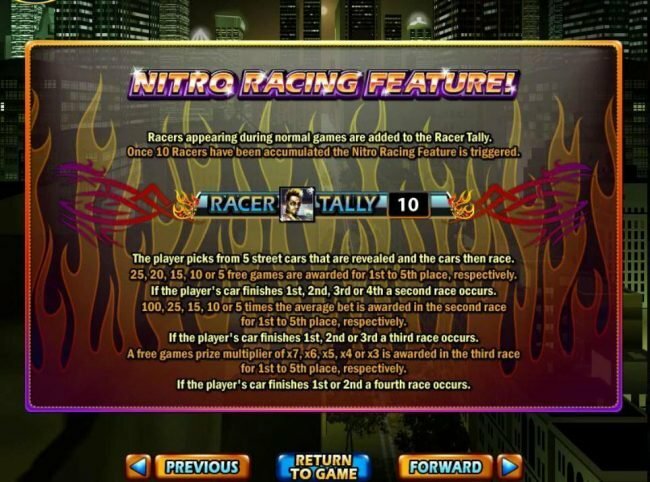 The racer will reward you with a multiplier of three though and the opponent will not. Scatter symbols are represented by a light that will change either green or red when their on the reels. You will then trigger the Dream Run bonus round. 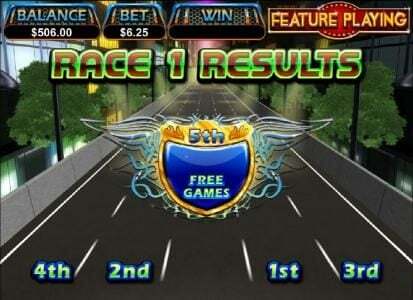 When you trigger this Bonus round you will either be rewarded with 5, 10, 15, 20 or 25 free spins depending on which of the five street racers you choose. 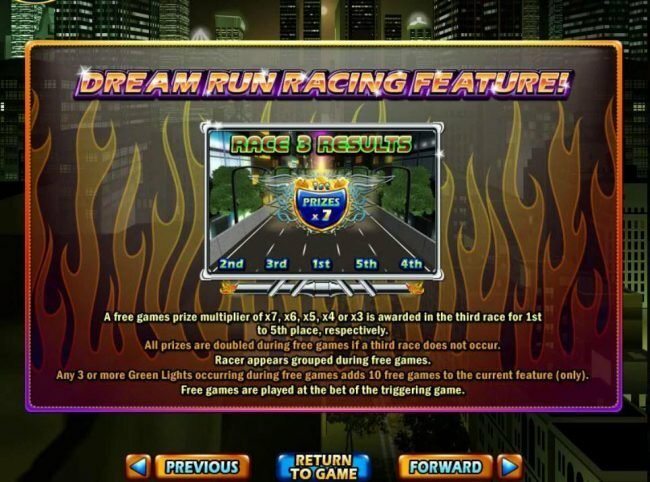 You will also be able to get a 5, 10, 15, 25 or a 100 time multiplier depending on your final position in the race. 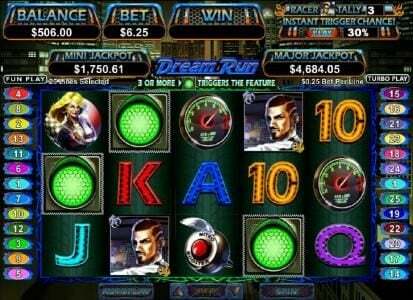 Dream Run is truly one of the most unique, thrilling and jaw dropping slot games we have ever seen come from RTG. 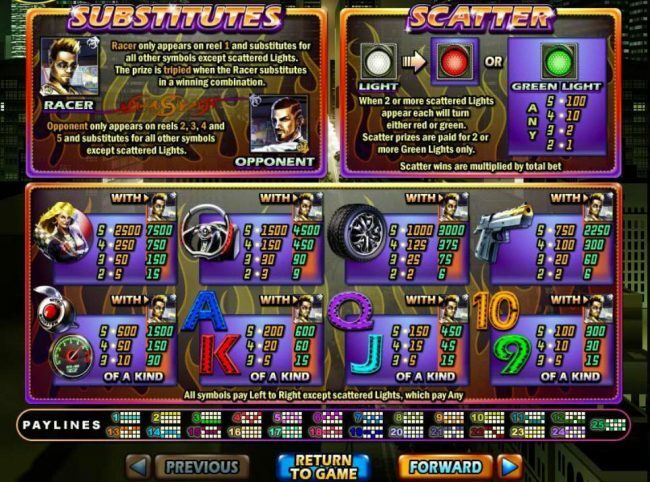 It has a ton of different game features which will allow you to win a lot of money throughout the game. The graphics are outstanding and the sound performance seems like surround sound making for a perfect combination of true slot action. 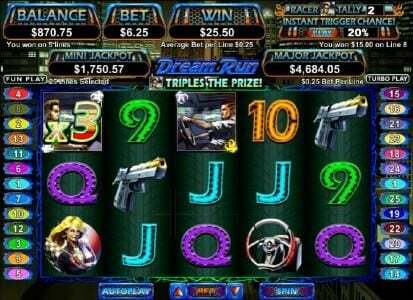 This RTG casino True Blue Casino delivers fun games along with a $15 no deposit bonus and a great 200% bonus all the way up to $2000. 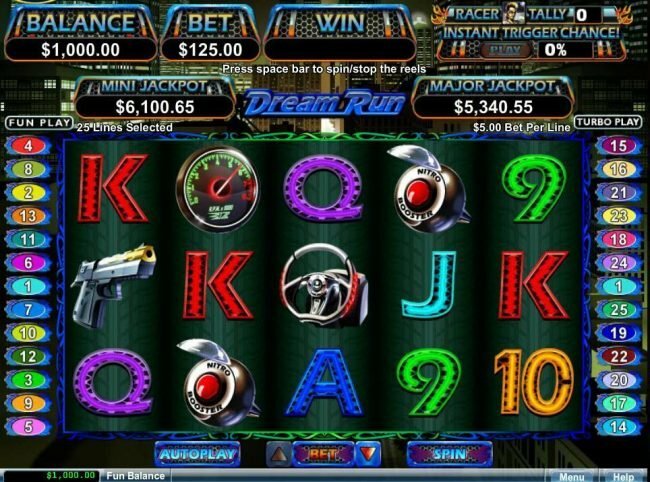 Dream Run video slot was a fun and unique slot to play. I had the bonus a couple times, but didn't win a whole lot. Worth giving a try. I rate this a 8 out of 10. 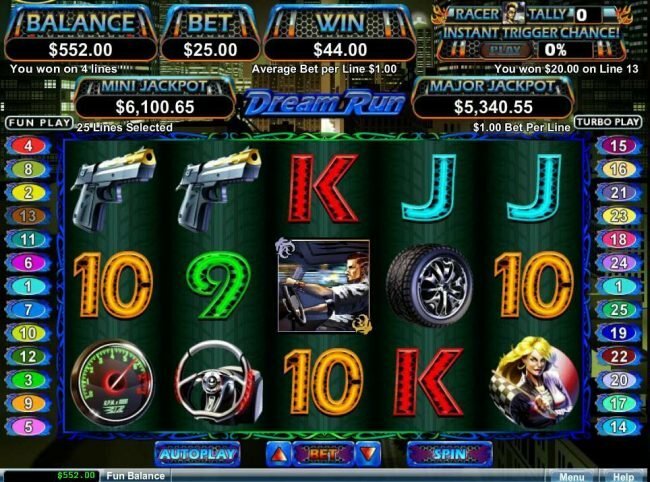 This is a BRAND NEW SLOT that has been released from the RTG platforms. It is my absolute favorite at the moment. My mission is to win the MAJOR JACKPOT after having a taste of winning the MINOR JACKPOT. If you are wondering how? Well it has everything to do with the racing car you pick in the feature. 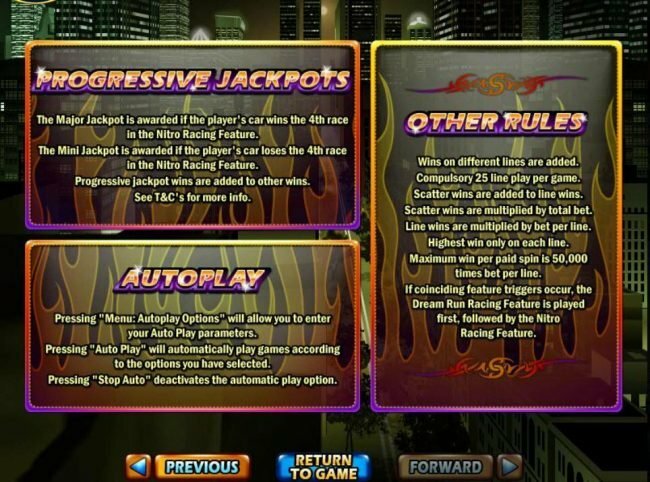 If you come 1st, 2nd, or 3rd in the race feature, you proceed to the next level in the feature- this is the multiplier. Same applies, I can only imagine if you get to your 4th/5th race in the feature this will determine your JACKPOT WIN. 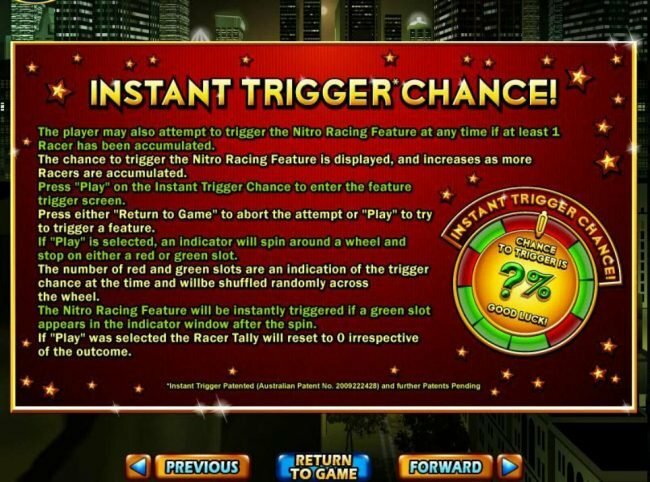 I enjoy playing slots with the feature guarantee which you can trigger before its reaches 100%. I try my best not to trigger the feature before 50%. The slices in the feature guarantee wheel are slightly larger than your normal feature guarantee wheel. Go have a spin for yourself and see what I mean!